This roasted butternut squash is a snap to fix. Just toss cubes with olive oil, sage, and optional onions and roast. The onions add a nice flavor, but they can be left out. Or you might try this colorful recipe for ​roasted Brussels sprouts and butternut squash with cranberries and pecans. Serve this flavorful roasted butternut squash with a holiday meal or as a side dish with just about any meal. Feel free to use a similar winter squash, such as acorn, Hubbard, buttercup, etc. Line a large baking pan or roasting pan with foil. Lightly oil the foil or spray with nonstick cooking spray. Heat the oven to 400 F.
With a vegetable peeler or y-peeler, peel the squash. Slice in half lengthwise and scoop out seeds. Cut the squash into 1-inch cubes. Toss the squash and onion chunks with the olive oil, pepper, and sage. Arrange on the prepared baking sheet. Sprinkle with salt and pepper. Roast for about 30 to 40 minutes, turning occasionally, or until the squash is tender and lightly browned. 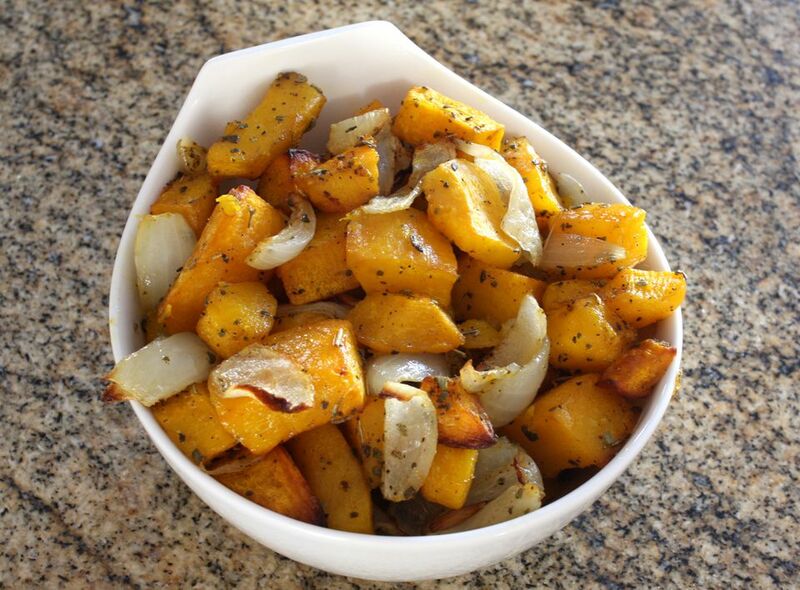 Sweet spiced roasted butternut squash: Omit the onions, sage, and pepper. Add 2 tablespoons of maple syrup, ​1/2 teaspoon of cinnamon, and a dash of cayenne pepper to the squash along with the olive oil. Toss and roast as directed.